We are excited to release a big update to campaigns in Pulsate that will give marketers even more tools to reach and engage users. The last major campaign update that we released added campaign cards and we have been blown away with the creative ways that our customers have utilised those cards to send amazing content. Over the past few months, our team have been working hard on a new update to campaigns to add even more campaign options and today we are excited to announce that this update is now live for all customers. This update gives marketers more control of campaign notifications so that even more granular and creative campaigns can be sent using Pulsate. Now instead of bringing users only to a campaign card, you can route users to a host of other locations both inside and outside of your app directly from a push notification or in app notification. If you want to send a card based campaign, Multi-Channel is the option for you and it will function just like card based campaigns have always worked with Pulsate. However, if you would like to send a notification that brings a user to anywhere other than a campaign card, choose Push Notification Campaign or In-App Notification Campaign. 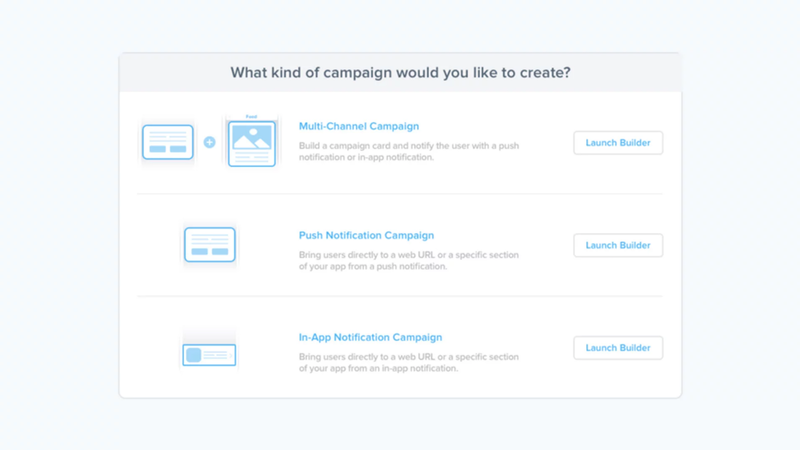 Choosing either of these options will launch the campaign builder and you will be able to begin crafting your notification. Remember, push notifications are great for urgent campaigns where you want to get the message out as quickly as possible. Sales and time sensitive offers make great push notifications because it is important to let as many users as possible know about them as soon as possible. However, push notifications can also be quite disruptive for users and you should try and limit them to only the most urgent campaigns. For less urgent campaigns, in app notifications are a great option. The user will receive the in app notification either the next time they enter the app or when they carry out a specific action within the app. Choosing the Deeplink option enables you to bring users who open the notification to a specific part of your app. Any section of your app can be chosen once a deeplink has been added for that section to your app project and you have uploaded that deeplink to Pulsate. For more information on using deeplinks with Pulsate, check out our documentation here. Bringing users to a different part of your app is a great way to onboard new users. Notifications can be sent to new users outlining the great features of your app and you can bring users directly to those features when they open that notification. Whilst a deeplink enables you to bring users to anywhere within your app, choosing a URL enables you bring users directly to any web page outside your app. When users click on this notification, the browser on the device will be opened and the web page that you specified will be loaded. Opening a URL directly from a notification is a great option if you want to bring users directly to your own website or a site connected with your campaign. If you have an online store, you can bring users directly to that store or even directly to a particular product. Choosing this option opens the user’s feed where all of the cards that they have previously received are stored. This option will open the home page of your app when the push notification is opened. If you send an in app notification, there is no need to open the app as the user is already there so this option changes to Dismiss and it will close the notification when the user clicks on it. Once you have chosen the perfect destination for your notification, you can specify the targeting and delivery options for that campaign to choose who should get the campaign and when they should receive it. When users open any notifications, it will be recorded by Pulsate as a campaign open so that you can track performance and user engagement in the Campaign Stats section of Engage. Please note that to take advantage of these new features, you will need to update the Android and iOS Pulsate SDKs in your app to version 2.8.0. For more detailed information on using the features outlined in this post, we have full documentation located here for push notifications and here for in app notifications.